Pierre Hardy is a French designer. His previous career record includes working for such fashion houses as Christian Dior, Balenciaga and Hermès. This fashion label is making shoes and handbags. The brand's stores are located worldwide in Moscow, Paris, New York, Milan, Hong Kong and many more cities. This brand has a man handbag line too. It's very urban and trendy. 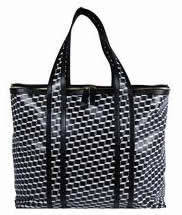 There are large selection of weekender bags and tote bags for men. The square block pattern looks very elegant and masculine for these handbags. Handbags and carryalls by this designer can be purchased in the brand's official stores and also some of the big luxury retailers, such as Barney's in New York have men's handbags from this brand and they also sell online. You can look up also other fashion stores (the big ones) that sell designer products via internet, as currently this brand does not have their own e-store available yet. 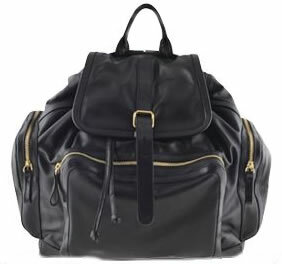 If in need of a stylish backpack - here it is from the new collection. Solid black color, classic shape and it is also available online. The buckle strap is a bit of tribute to classic backpacks and zipped pockets are added for more comfort. Overall - this is a decent bag to take on a hike, travel or own it simply for daily use. However, if you are more into fashion, there are some more extravagant models available for you as well. 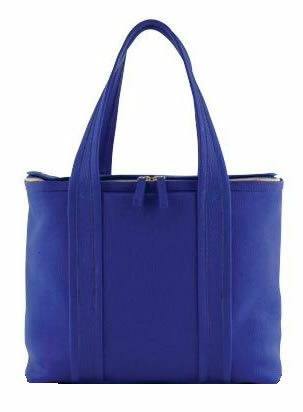 For example, this bright blue tote can be used for shopping or carrying other daily essentials. The color is rather bright for it to be a typical male handbag, but for those who love a little bit more of fashion, this will be quite noticeable tote to carry. Also beautiful document cases are also available. This brand also has masculine gym bags and classic briefcases. This might be the brand to choose if you like clean line designs and still are searching for some alternative.